The story of chat.io is coming to an end, but don’t take this the wrong way. For us, this is a new start. We based chat.io on the bold idea of creating a platform that, thanks to its API, enables users to customize the tool to their preferences and needs (even the most specific ones). What we love the most about it is how the app works for its customers, devs, as well as our development team. In contrast to monolithic products, in chat.io it’s super easy to implement new features, launch updates regularly or build integrations with other software. All in all, the technology incorporated in the chat.io app has been working great. The story of chat.io started once we discussed the future of LiveChat, the first chat application in our portfolio, mainly regarding its back end. We wanted to update it in a way that enhances our work with the app as much as possible. 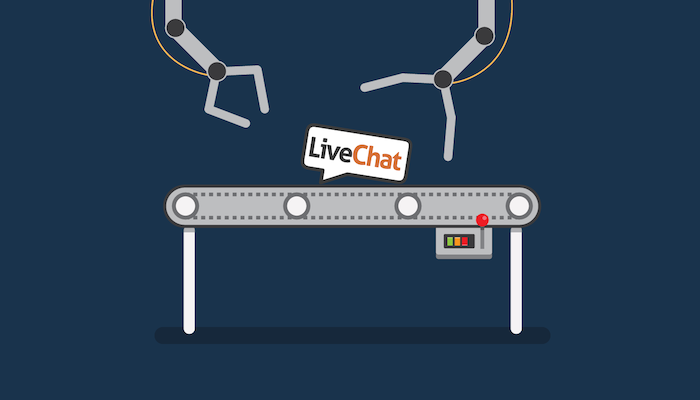 In 2002, we started to build our main product, LiveChat. It wasn’t an easy task, but the years have passed, our product gained maturity, and our customer base grew to over 26k businesses. Supplying software to such a large amount of companies means that we can’t take a lot of risks when implementing any service updates. On that basis, we decided to take all the technological ideas that we had in our mind and prove them right by building an independent product based on modern backend and introducing it to commercialization. In July 2017, chat.io was born, a modern, intuitive and easy-to-use messaging app. The platform technology, on which we built the product, allowed users to quickly adjust the product to their demands and enabled devs to go crazy with it. That was exactly what we were aiming for! Over the months, chat.io was developing really well, but we noticed that with the growing number of users, the demand for more features and updates in the product was also increasing. In practice, it looked like we have two products; one with modern technology but lacking advanced features, and the other vice versa. Like many tech providers, we are accustomed to adapting and refining our business strategy based on the situation we’re in. That’s why, after much talk, we decided to merge these two apps and create a super-product under the LiveChat label, much more recognized in the industry. From now on, we’re going to successively bring all the best from the chat.io app to the LiveChat experience. Building chat.io has been an amazing experience. We remember a twinkle in the project team’s eyes the moment we launched chat.io officially. It’s no fun for us to close the product, but we feel that’s the wise decision. Much thanks to all of you who have used chat.io over these months. That’s not the end – we offer you the best of chat.io in the LiveChat skin! We are excited for you to give LiveChat a try, hoping you’ll stay with us for a long time! If you’re in, please reach out to us at support@chat.io and we’ll handle the rest! Read below for answers to some frequently asked questions about the migration process from chat.io to LiveChat. When do you plan to finish the migration process from chat.io to LiveChat? We’re going to finish the process on April 2nd. Until then you should decide if you want to move your account to LiveChat. If you don’t want to be migrated to LiveChat, please contact us at support@chat.io and we will cancel your account. Will I have the same set of features in LiveChat as I have in chat.io? You will be migrated to LiveChat Starter plan and given a free, one year of subscription. You can see its features here but if you’re interested in a different LiveChat plan, feel free to choose it. We also offer you a 50% discount for your first payment if you decide to subscribe right away to any other LiveChat plan. This is a limited offer, valid until 16th of April only. Can I still use the same installation code on my website or do I need to install a new one? It’s not necessary to implement a new code after the migration process, but it’s good practice to always keep it updated, so we recommend you do it. Are there any differences between the LiveChat and chat.io pricing rules? Yes, after the transfer to LiveChat, you’ll be charged per seat. The number of seats determines the number of agents that can log in to your LiveChat at the same time. What will happen to my Chat archives gathered in the chat.io app? After the migration to LiveChat, you will have access to your last-60-days chat history (this limit refers to LiveChat Starter plan only). After the migration to LiveChat, will you keep all my settings or will I have to configure my account one more time? We will migrate all your account settings (incl. pre-chat survey, chat invitations, chat window customization, canned responses). Will information about customers banned in chat.io be moved to the LiveChat app? Will unassigned chats be moved to the LiveChat app? Will you keep my chat window settings? Yes, we will migrate them. Although, in the LiveChat app, you will have many more options for chat configuration – don’t forget to take a look at them. Can I still use my integration between chat.io and Facebook Messenger in LiveChat? In LiveChat, you have access to Facebook Messenger integration free of charge. However, you will have to install it one more time on your account. Can I still use the integration with ChatBot? After the migration to LiveChat, your ChatBot integration will be still active. Why is the LiveChat API in beta? We called it ‘beta’, because we’re going to implement several minor changes any time soon, but the LiveChat API is stable.